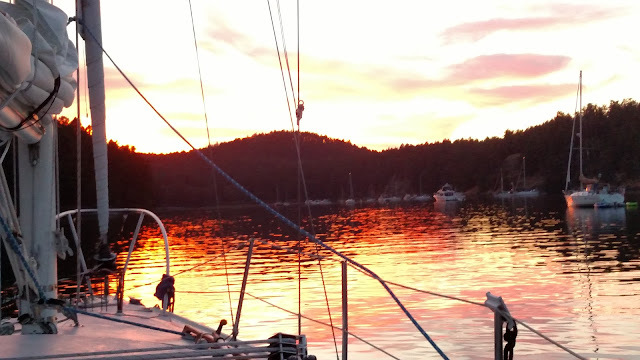 After the exhilarating high of being in that pod of Orca Whales for an hour and forty-five minutes, my sister and I had to make way to the first scheduled anchorage in the San Juans - Reid Harbor on Stuart Island. I had never been to this island before, and although I had read about it, and saw a DVD about the island, It still didn't compare to the real thing. It was getting fairly late in the day when we arrived and we motored down the long harbor about half way when we found a pretty good place to drop the hook. In hind site, you have to go just about all the way in before you get to the Marine State Park. The harbor is pretty long!